Sure enough, this is exactly what happened, though it took a bit longer than expected. On November 29, 2013, the Rev. Paul Kramer, a (former) associate of the Rev. Nicholas Gruner and the pseudo-Traditionalist Fatima Center, announced he was convinced that Francis was not a true Pope but a manifest heretic, and that Benedict XVI was still the reigning Pope, his resignation having been invalid. We covered the story in this blog post. While we were happy to see that another well-known Novus Ordo personality had come to realize that the false pope in Rome is truly an impostor, we were dismayed that “Fr.” Kramer would accept the silly idea that it was Joseph Ratzinger's resignation that was invalid, rather than his election in 2005. (Benedict, now claiming the title “Pope Emeritus”, is naturally on the record as supporting Francis.) Regardless, Kramer is by no means the only person of this interesting persuasion, which we have nicknamed “Resignationism.” In addition, the apparently omnipresent Kazakh auxiliary "Bp." Athanasius Schneider has hinted at the Ratzinger resignation’s suspected invalidity by saying, “It is difficult to believe that Pope Benedict XVI freely renounced his ministry as successor of Peter” (source). The Resignationist movement was simply bound to emerge, especially after it became woefully evident to many that Jorge Bergoglio, “Pope Francis”, is so far removed from Catholicism that to believe this man could actually be the head of the Roman Catholic Church is simply absurdity on stilts. But rather than embracing Sedevacantism and recognizing that Ratzinger is no less of a Modernist than Bergoglio, differing from him only in style and loquacity, some people prefer to adhere to the more attractive position of Resignationism. Anything to keep from becoming sedevacantist, apparently. (By the way, the idea that “Cardinal” Angelo Scola was elected as the true successor to Benedict XVI has also been floated — see here.) As we now know, February 11, 2013, was but the first act of what would become a very historic and turbulent year, and then some. It is for good reason that we have given Benedict's talkative successor the moniker of “Chaos Frank.” (He himself asked for a “mess” at World Youth Day, remember?) Chaos it truly has been ever since. Lightning struck St. Peter's Basilica the very day Ratzinger announced he was stepping down -- not once but twice. As well it should have, considering what we have seen and heard since. These descriptions of the various types of Liberals are as timely today as ever. Which one fits Benedict XVI and John Paul II? Which one fits Francis? The most dangerous wolf is the one in sheep’s clothing, not the one who doesn’t bother to disguise himself. Beware, then, lest ye be misled: “Therefore God shall send them the operation of error, to believe lying” (2 Thess 2:10); “For there shall arise false Christs and false prophets, and shall shew great signs and wonders, insomuch as to deceive (if possible) even the elect. Behold I have told it to you, beforehand” (Mt 24:24-25). Quapropter bene conscius ponderis huius actus plena libertate declaro me ministerio Episcopi Romae, Successoris Sancti Petri, mihi per manus Cardinalium die 19 aprilis MMV commisso renuntiare ita ut a die 28 februarii MMXIII, hora 20, sedes Romae, sedes Sancti Petri vacet et Conclave ad eligendum novum Summum Pontificem ab his quibus competit convocandum esse. 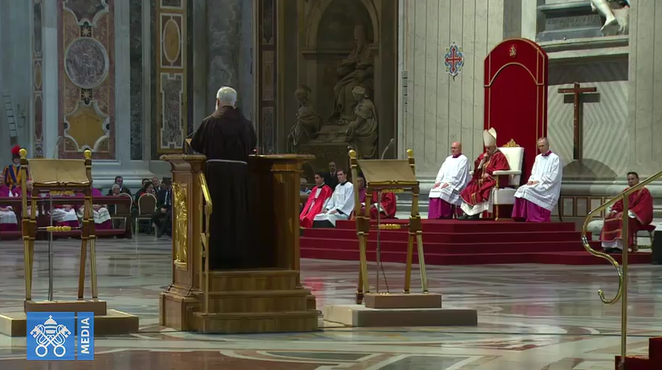 These were the exact words Benedict XVI uttered in the presence of all his “cardinals” gathered in the Vatican’s Consistory Hall (video of the event available here). 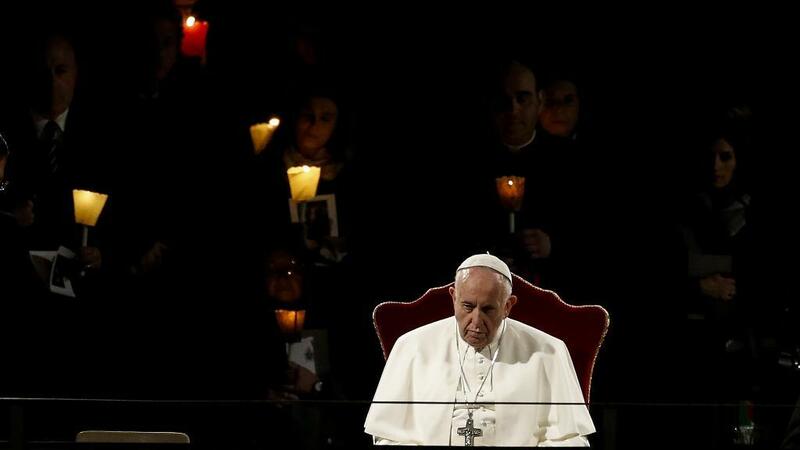 Chirri had one crucial advantage over many other journalists covering the consistory: She understood Latin and didn’t have to wait for a vernacular translation of Benedict’s speech to be handed out. Novus Ordo Watch was among the first web sites in the world to announce the resignation of Joseph Ratzinger — even before Vatican Radio, before the Drudge Report, before CNN.com, before FoxNews.com, before Pewsitter, before Rorate Caeli. Indeed, not finding Benedict’s resignation reported on any of these sites made it extremely difficult to confirm the story. A few minutes later, Vatican Radio posted the official announcement of Benedict’s resignation, which you can read at this link. I desire therefore, first of all, that supplications, prayers, intercessions, and thanksgivings be made for all men: For kings, and for all that are in high station: that we may lead a quiet and a peaceable life in all piety and chastity. For this is good and acceptable in the sight of God our Saviour, Who will have all men to be saved, and to come to the knowledge of the truth. Benedict’s resignation was a veritable earthquake that sent shockwaves throughout Novus Ordo Land and the entire world. No papal claimant (whether genuine or fake) had resigned since the 15th century. Sure enough, this is exactly what happened, though it took a bit longer than expected. On November 29, 2013, the Rev. Paul Kramer, a (former) associate of the Rev. Nicholas Gruner and the pseudo-Traditionalist Fatima Center, announced he was convinced that Francis was not a true Pope but a manifest heretic, and that Benedict XVI was still the reigning Pope, his resignation having been invalid. We covered the story in this blog post. While we were happy to see that another well-known Novus Ordo personality had come to realize that the false pope in Rome is truly an impostor, we were dismayed that “Fr.” Kramer would accept the silly idea that it was Joseph Ratzinger’s resignation that was invalid, rather than his election in 2005. (Benedict, now claiming the title “Pope Emeritus”, is naturally on the record as supporting Francis.) Regardless, Kramer is by no means the only person of this interesting persuasion, which we have nicknamed “Resignationism.” In addition, the apparently omnipresent Kazakh auxiliary “Bp.” Athanasius Schneider has hinted at the Ratzinger resignation’s suspected invalidity by saying, “It is difficult to believe that Pope Benedict XVI freely renounced his ministry as successor of Peter” (source). As we now know, February 11, 2013, was but the first act of what would become a very historic and turbulent year, and then some. It is for good reason that we have given Benedict’s talkative successor the moniker of “Chaos Frank.” (He himself asked for a “mess” at World Youth Day, remember?) Chaos it truly has been ever since. Lightning struck St. Peter’s Basilica the very day Ratzinger announced he was stepping down — not once but twice. As well it should have, considering what we have seen and heard since. What was not yet quite visible in 2013 but has become manifest since then, is that there has been a growing movement of unrest and exasperation with Francis, especially since the October 2014 Synod on the Family, its successor synod a year later, and most especially since the publication of the notorious post-synodal exhortation Amoris Laetitia. The mask is off, and the apostasy is plain for all to see. Unfortunately, so many still stubbornly cling to the idea that Francis is the Pope; and, not being able to reconcile that fact with traditional Catholic teaching on the Papacy, are now trying to find ways to water down that teaching. The greatest danger in all of this, however, is not so much Bergoglio’s own clear defection from Catholicism, but rather the fact that since Francis is so obvious and bold in his apostasy, he makes the more “moderate” apostates like Benedict XVI and John Paul II look Catholic by comparison. We are surrounded by Liberalism in all its shapes and varieties, and it behooves us to be on our guard against its subtle dangers. To lay down special rules by which we may detect it in its shadings and minutiae is neither practical nor necessary. But some general directions may be given. Their application must be left to each one’s proper discretion. 1) Extreme Liberals; 2) Moderate Liberals; 3) Quasi Liberals, or those only tainted with Liberalism. We will essay a description of each of these types. The study of their physiognomy will not be without interest and profit, for in the types we shall find a rule for our guidance in distinguishing Liberalism in its practical details. The Extreme Liberal is easily recognized; he does not attempt to deny or conceal his perversity. He is the declared enemy of the Pope, of priests, of everything ecclesiastical; a thing has only to be sacred to rouse his implacable wrath; “priestcraft” is his favorite shibboleth. He subscribes to all the most violent and incendiary journals, the more impious and blasphemous, the better to his liking. He is ready to go to the furthermost conclusions of his baneful system. His premise of destruction once laid down, his conclusion of nihilism is a mere matter of logic. He would put it into practical execution with pleasure and exultation if circumstances permitted. He is a revolutionist, socialist, anarchist. He glories in living a life devoid of all religion. He belongs to secret societies, dies in their embrace and is buried by their ritual. He has always defied religion and dies in his defiance. The moderate Liberal is just as bad as his extreme confrere, but he takes good care not to appear so. Social conventionalities and good manners are everything to him; these points secured, the rest is of little importance. Provided his iniquity is kid-gloved, it finds ready extenuation in his own mind. The niceties of polite society preserved, his Liberalism knows no bounds. He would not burn a convent — that would appear too brutal, but the convent once burned, he has no scruple in seizing upon the outraged property. The cheap impiety of a penny paper grates on his well-bred nerves; the vulgar blasphemy of Ingersoll he deprecates; but let the same impiety and the same blasphemy appear in the columns of a so-called reputable journal, or be couched in the silken phraseology of a Huxley in the name of science, and he applauds the polished sin. It is with him a question of manner, not matter. At the mere mention of the name of a nihilistic or socialistic club, he is thrown into a cold sweat, for there, he declares, the masses are seduced into principles which lead to the destruction of the foundations of society; yet, according to him, there is no danger, no inconvenience in a free lyceum where the same principles are elegantly debated and sympathetically applauded; for who could dare to condemn the scientific discussion of social problems? The moderate Liberal does not detest the Pope; he may even express admiration for his sagacity; he only blames certain pretensions of the Roman Curia and certain exaggerations of Ultramontanism, which do not fall in with the trend of modern thought. He may even like priests, above all, those who are enlightened, that is, such as have caught the twang of modern progress; as for fanatics and reactionaries, he simply avoids or pities them. He may even go to Church and, stranger still, sometimes approach the Sacraments; but his maxim is, in the Church to live as a Christian, outside of the Church to live as the world lives, according to the times in which one is born and not obstinately to swim against the stream. He dies with the priest on one side, his infidel literature on the other and imagines that his Creator will applaud his breadth of mind. The Catholic simply tainted with Liberalism is generally a good man and sincerely pious; he exhales nevertheless an odor of Liberalism in everything he says, writes, or takes up. Like Madame de Sevigne, he can say, “I am not the rose, but standing by it, I have caught some of its perfume.” This courageous man reasons, speaks, and acts as a Liberal without knowing it. His strong point is charity; he is charity itself. What horror fills his soul at the exaggerations of the Ultramontane press! To treat as a liar the man who propagates false ideas is, in the eyes of this singular theologian, to sin against the Holy Spirit. To him the falsifier is simply misguided; it is not the poor fellow’s fault; he has, simple soul, been misled. We ought neither to resist nor combat him; we must strive to attract him by soft words and pretty compliments. These descriptions of the various types of Liberals are as timely today as ever. Which one fits Benedict XVI and John Paul II? Which one fits Francis? The most dangerous wolf is the one in sheep’s clothing, not the one who doesn’t bother to disguise himself. Beware, then, lest ye be misled: “Therefore God shall send them the operation of error, to believe lying” (2 Thess 2:10); “For there shall arise false Christs and false prophets, and shall shew great signs and wonders, insomuch as to deceive (if possible) even the elect. Behold I have told it to you, beforehand” (Mt 24:24-25).